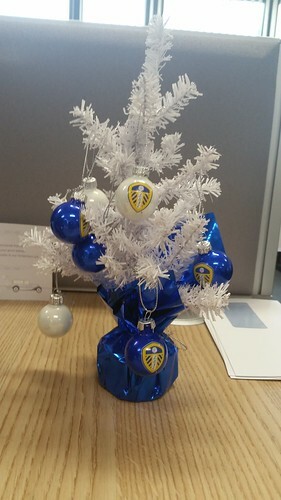 This is my attempt at making my new workplace more festive. I’ve even planned ahead for next year, by buying a 2017 calendar. It’s all well and good until the office Derby County supporter tears it all down, while I’m on annual leave. The question is, what Leeds United player should be the fairy on the top? Welcome back to my blog. I’ve been away from here for a long time, but fear not, I will (hopefully) keep this blogging going again. So where have I been? I suffered an accident at work, injuring my leg. A pitiful excuse for not blogging, as I don’t type with my toes. I had a bit of time off work, but have since returned, albeit still using a crutch, for the time being. Besides getting crocked, the following noteworthy things happened to me over the last couple of months. – Starting a new job. I haven’t travelled far from my old one. No more than 10 feet to be exact. I received a new desk, computer, chair and mouse as part of my transfer fee from the IT Service Desk. The new job is a lot more interesting and gives me a lot to learn. I don’t want to blow my own trumpet, but I had been doing the Service Desk job, in some form, for over ten years. I could therefore do it with my eyes closed. The new challenge is therefore most welcome, although I can’t close my eyes as much anymore. – Christmas shopping. I hate going into town shopping at the best of times, let alone on the run up to the festive period. The last time I ventured into town in December, I felt like Mufasa from The Lion King, in that wildebeest scene. I therefore did all my Christmas shopping online, most of it coming from Amazon. The delivery drivers must have become well and truly fed up with driving down my little cul-de-sac – no wonder they’re all shitting into carrier bags. – Leeds United. I started my blog a month before they were relegated from the Premiership in 2004. Since then, most of my posts have been moaning about how badly they have been performing. Coincidentally, since I stopped blogging in September, they’ve been doing bloody well. I have finally recovered from my man crush of Simon Grayson and Luciano Becchio. 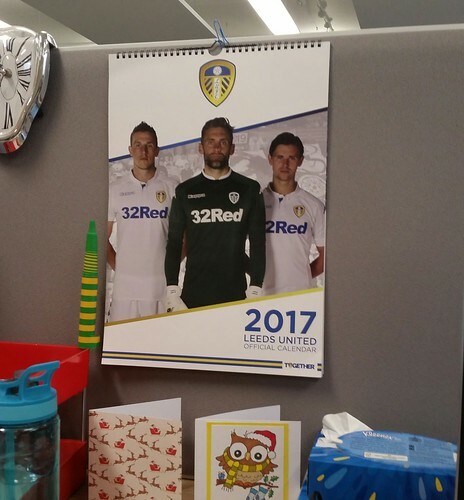 I have two new heroes in my life – Garry Monk and Pontus Jansson. So well are Leeds doing right now, that if they’re not careful, they’ll end up getting promoted. No doubt the fact I am blogging again, I’ll jinx the entire football club and they’ll be relegated in January. – Holiday! – we had two holidays planned since I last blogged. The first trip was to Butlins in Minehead. We went there a couple of years ago and enjoyed ourselves so much, we thought we would return. The last time we went, we stayed in a dirty old chalet, on the top of a dangerous looking staircase. This time, we paid a little extra for a cleaner, nicer and modern apartment, right next to the sea. Our second holiday was to Weymouth. This would have been lovely, apart from the fact we didn’t go! We awoke on the morning we were supposed to leave, to find that the house was freezing cold. Upon in investigation, we discovered that the boiler had broken – we had no heating or hot water. Many hours later, we got a plumber to fix it, and both and heat and warmth were restored. By this point, we had missed the chance to go to Weymouth, so enjoyed a few days at home in Bath… at least it was warm. So that’s what you’ve missed. I’ll be back blogging again in another 3 months. See you in March!